Water levels in Iraq's reservoirs and dams have reached historic heights, officials have told AFP, with thousands of families facing possible displacement by more flooding. Weeks of rain compounded by melting snowcaps in neighbouring Turkey and Iran have almost filled Iraq's four main reservoirs and swelled the Tigris and Euphrates rivers. In Samarra, north of Baghdad, water is being diverted into the natural reservoir at Tharthar Lake in amounts unseen in decades, said dam chief Kareem Hassan. "Today, the Tharthar barrage is seeing the highest levels of water passing through in its history," Hassan told AFP. "We haven't seen such levels pass through the structure since it was founded in 1956, so 63 years." The Dukan dam in the northeast also "had not witnessed water levels this high since 1988," said manager Hama Taher, calling on people living nearby to leave. Authorities have said the excess will be stored in reservoirs ahead of expected droughts during blistering summer months, and have pre-emptively restricted farmers from planting crops that need high amounts of water. The water arriving at Tharthar is gushing south from Iraq's largest reservoir in Mosul, currently holding nine billion cubic meters of water—some two billion short of capacity, the water ministry has said. The high levels have put two bridges linking the banks of Mosul under water, leaving truck drivers stranded with goods on either side. "We have officially told kiosk owners and residents to get away from the banks," said Hussem al-Sumaidai, who heads civil defence operations in the broader Nineveh province. 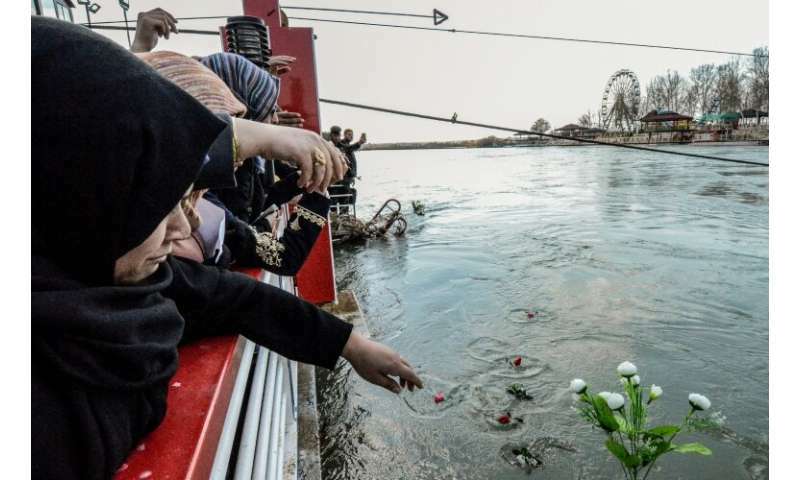 Water levels in Mosul were also blamed by some for last month's ferry drowning that killed more than 100 people. Further south, villages and surrounding fields have been flooded, sending farmers into a frenzy. 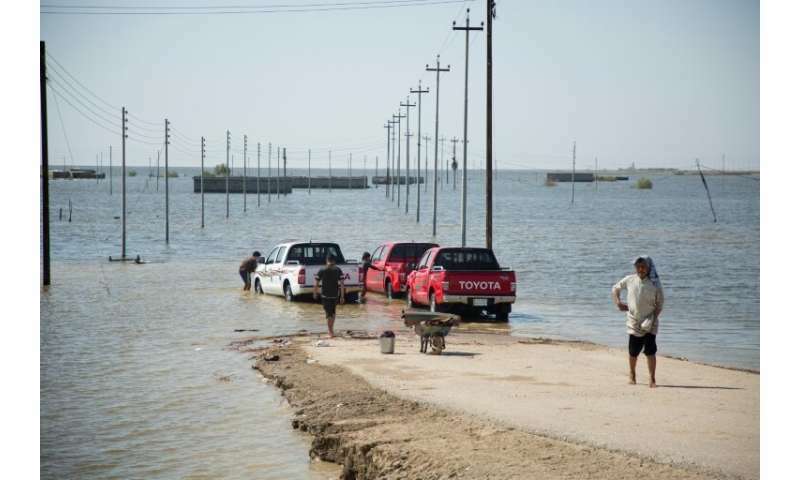 More than 8,000 hectares of agriculture have been flooded in the small village of Huweidi in Basra province alone, according to its mayor Mohammad Nasseh. Hundreds of families were displaced in the southern province of Missan, with another 2,000 possibly forced to flee soon, the United Nations has said. The UN has had to deliver humanitarian aid by boat in some areas due to flooding, it said on Wednesday. Despite reassurances by the Iraqi government, the high levels have sparked concern among observers including environmental scientist Azzam Alwash. The Mosul dam was built atop a bedrock of gypsum, a mineral that dissolves in water. That foundation requires regular cement injections to prevent cracks in the gypsum from expanding. "If the bedrock settles as a result of cavities, that settlement will translate into damage to the core of the dam which cannot be undone and can possibly lead to catastrophic consequences," Alwash told AFP on Thursday. "If the dam fails when it's full, the area will be under five metres of water," he said.